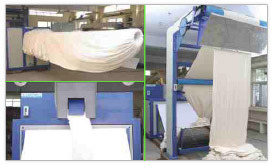 The input fabric in Roll Form is De rolled and fed to the Reversing Machine for Reversing the fabric and the Reversed Fabric is then Plaited and transported to the subsequent dyeing process. This combination is most desirable, if high volumes of reversed and plaited fabric are required for the subsequent dyeing process. 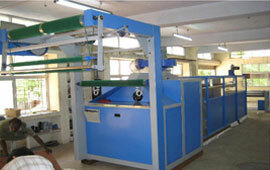 'CARDWELL' can offer a suitable 'LOT PREPARATION MACHINE' consisting of the 'De-Rolling and Plaiting System'. By this arrangement, two to three different lots of fabrics could be De-Rolled and plaited at a time, depending upon the capacity of the Dyeing Chamber. 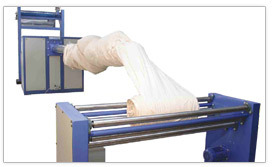 De-Rolling or unwinding of the Tubular Fabric in roll form prior to reversing is through positively driven Stainless Steel Unwinding Rollers. Reversing Tubular Fabrics without mechanical traction. Innovative air stream system controlled by pneumatic cylinder and valves. Bio Dust Suction arrangement with filter box. Plaiting through Stainless Steel Guide Rollers, Geared Motor controlled by AC Inverter, eliminates any stretch to the fabric. Stainless Steel Tube of lengths 4 meters of 5 meters of 6 meters could be supplied. High volumes of fabric can be reversed, much faster, resulting in huge savings of labour.